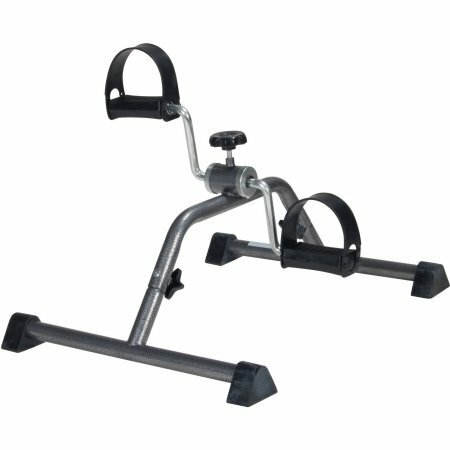 Enjoy exercising without limits with the Exercise Peddler with Attractive Silver-Vein Finish. This device is designed to help get your blood pumping and legs moving with simple, yet effective, low-impact exercises. The Drive Medical peddler helps to stimulate circulation as it tones leg and arm muscles. It is the ideal machine for the elderly, disabled or those recovering from a recent accident or injury to use in order to stay active. It features four anti-slip rubber pads that prevent sliding while also protecting the floor's surface from damage. The level of tension can be easily adjusted to make the workout as simple or as strenuous as you want it. The floor peddler features a compact size that is ideal for storage and transport. It has an attractive silver-vein finish and weighs only 5.88 pounds. Actual product weight: 5.88 lbs Overall product height: 12.2" Overall product length: 16.93"
If you have any questions about this product by Drive Medical*, contact us by completing and submitting the form below. If you are looking for a specif part number, please include it with your message.